Many thanks to Susie James for these photos. Read her article on Narmour and Smith here. 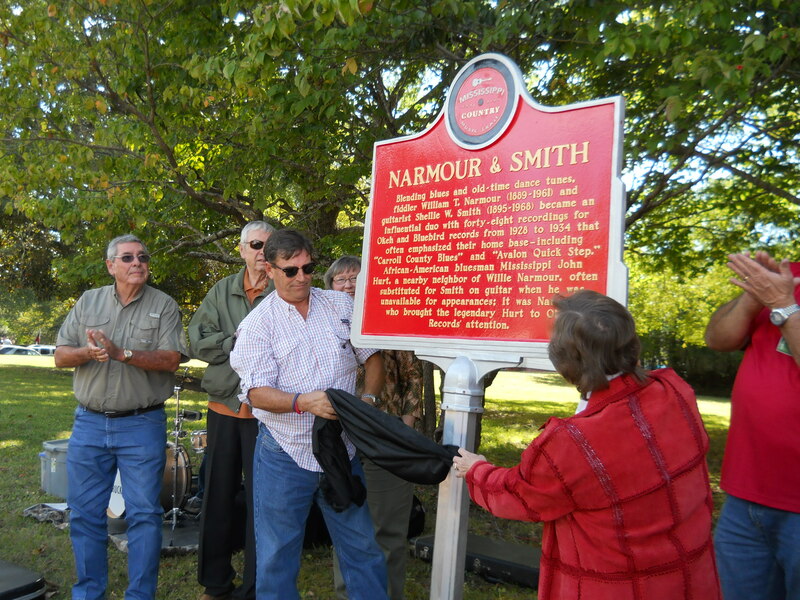 The unveiling of the Narmour and Smith marker was done by Chip Narmour and sister Laura N. Oakes, both children of Willie’s son, the late Coleman Narmour, who shared his dad’s story of how “Carroll County Blues” came into being. 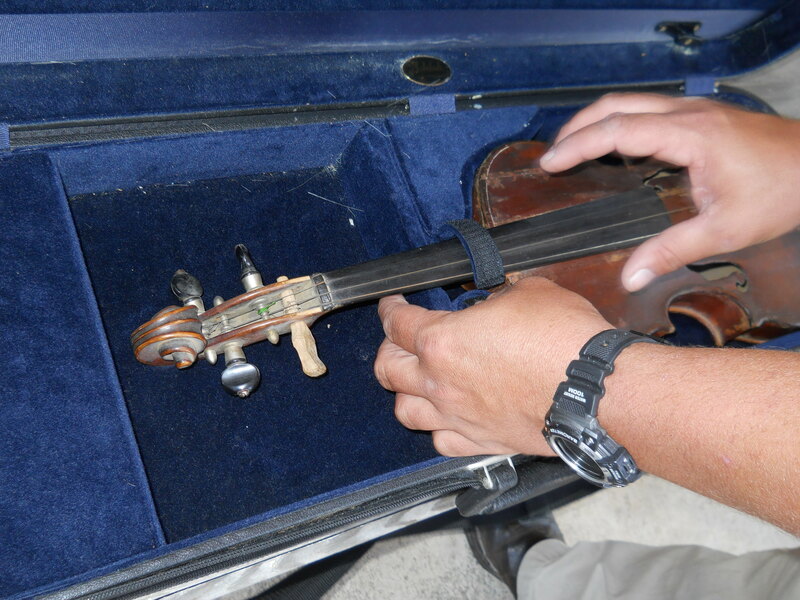 Hands carefully removed Willie Narmour’s fragile old fiddle with its hand-whittled turning peg out of its carrying case to show the public on Narmour & Smith’s big day in their county seat of Carrollton, Mississippi. Narmour and his partner, Shellie Walton Smith, were “Narmour & Smith,” who in 1929 recorded a rousing tune they had created, “Carroll County Blues.” The duo made other recordings as well, but the Depression stunted the growth of the recording industry for years. Like John Hurt, Narmour and Smith were poor farmers — though talented musicians. As people from that era often observed: Nobody had any money back then. Hurt would at times “spell” other musicians, including Narmour & Smith, at house parties, which comprised much of the entertainments throughout the countryside. A soft-spoken farm worker who at the time lived in the same shotgun cabin that in July 2002 was dedicated (in a different location than from when the Hurts lived in it up on the Perkins place a bit east of the Valley Store) as the Hurt Museum, John Hurt had kept busy during the intervening years playing guitar and singing mostly for neighborhood events. This is a part 2 of a newspaper article, begun here. Several tunes bear the root, “Charleston”, referring not to the type of tune, but to a town in neighboring Tallahatchie County, Miss., and “Carroll County Blues” came because Narmour and Smith thought it appropriate to name one of the tunes for where they lived. To Carroll Countians Narmour and Smith were true, and at home their fame never waned. It would be the connoisseurs and the record collectors in decades to come, however, who would rediscover the old Narmour and Smith recordings and assure their niche in American music history. Among those are Joe Bussard of Frederick, Md., whose 25,000-piece collection includes most of the N & S records as well as early records by the partners’ neighbor, John Hurt, who became internationally known after a blues historian named Tom Hoskins found him in 1963. Narmour and Smith were responsible for Hurt’s first brush with the record industry, recommending their neighbor when talent scouts asked them if they knew any good black guitarists. In 1963 it was too late for Narmour’s second chance. He had a minor stroke in the mid-1950s and a massive stroke killed him March 24, 1961. He was born March 22, 1889. During his exploratory trip into Mississippi in the 1960s Hoskins spoke with Smith, who had been working as custodian at nearby Valley High School, a country school that closed in the late 1960s. It was also too late for Smith, whose “boomchang” guitar underscores his and Narmour’s now-precious recordings. Smith, born Nov. 26, 1895, died Aug. 28, 1968. Their graves are marked by modest headstones in cemeteries along the road from Valley. Narmour, whose day to day work included driving a school bus, farming, and in the 1930s, running a mechanic’s garage at Avalon, is buried in the old Pisgah Cemetery alongside his widow, Velma Carroll Narmour, who died in 1978. Smith is buried in Moore’s Memorial Cemetery behind Pisgah Church. His widow, Lillian Kirby, died April 17, 1985 and is buried next to him. Thanks to Harry Bolick for finding this and making it freely available. Coleman Narmour recounts this story his father, fiddler Willie T. Narmour, told him about the origin of his enduring hit tune, “Carroll County Blues”: “He said he was leaving Leflore one fall. He’d taken a wagonload of cotton to the gin that morning. You’d have to wait your turn in line, so between sundown and dark his cotton had been ginned, and he and his mules were heading on back home. A little black boy was sitting on a train depot with a jew’s harp, trying to mock a train. From that he got the tune, and got to fiddling the next day on the “Carroll County Blues.” Willie Narmour and his partner, Shell Smith, recorded the song in 1929 and went on to make a slew of other records before first, the Depression nearly squeezed life out of the recording industry; then, changing times altered the quality and tastes of it. “Carroll County Blues” became legend and was subsequently recorded by many other musicians. Regionally at least, it’s in live repertoires, a rousing hillbilly, then redneck standard. Yet Narmour’s daughter, Hazel Wiggins of near Holcomb, will say quickly and decisively, “Nobody else can play “Carroll County Blues”. And there wasn’t a ‘Carroll County Blues’ until they went to the studio and recorded it.” Sounds mysterious, doesn’t it? Smith and Narmour, buddies, dirt poor farmers, played guitar and fiddled for country dances. They were a county item long before they were discovered by scouts from Okeh Records at a fiddling contest at Winona in 1927. Such contests, Wiggins recalls, “Daddy always won, until they wouldn’t let him enter anymore.” Neither wanted to go on tour. While stories of how they entertained their fellow passengers during train trips to recording sessions regaled their families and friends, the truth is, Narmour and Smith were home boys. 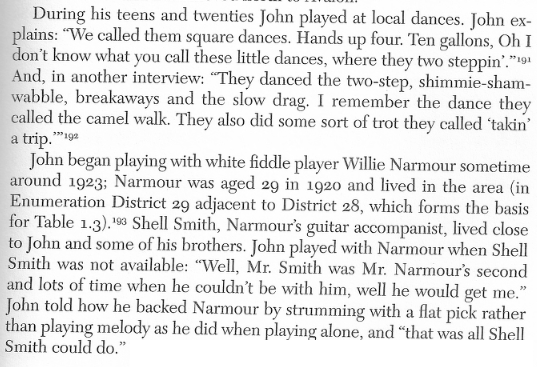 Narmour’s daughter shared memories of her father working out tunes, for which he and Smith had no names, and which they couldn’t commit to paper, because neither could read nor write music. Names of these nostalgic tunes were created simply because there had to be titles for the record labels. Titles, such as “Captain George Has Your Money Come”, “Who’s Been Giving You Corn?”, “Where the Southern Crosses the Dog”, “Sweet Milk & Peaches Breakdown” and “Winona Echoes Waltz” were products of discussions between the recording people and the artists “on the spot”, Wiggins said.